SMELLEZE Natural Ashtray Smell Remover Deodorizer: 2 lb. Granules Rid Smoke Stench Summary Get rid of ashtray smell without masking with harmful fragrances using Smelleze® Eco Ashtray Smell Removal Granules. Astray smells from cigarette, cigar & tobacco smoke doesn't stand a chance. Safe for people, pets & planet. This eco-friendly ashtray odor remover deodorizer really works to remove smoking odor! Features & Benefits • Simply sprinkle and smell the difference • Eliminates smoke odors instead of masking them • Eco-friendly, safe, non-toxic, non-flammable, odorless • Improves indoor air quality significantly • Creates a cleaner, healthier, safer, environment • Made in USA Eliminate Ashtray Smoke Odors & Reduce Fire Hazards Ashtrays in homes, offices, conference rooms, lobbies, cafeterias, restaurants, bars and smoking areas often result in offensive smoke odor problems and a potential fire hazard. The unwelcome lingering smoke odors could get worse over time if it is not treated. The Smelleze® Ashtray Smell Removal Granules were specially developed to eliminate lingering smoke odors in ashtrays on contact without masking them with fragrances. Smelleze® Ashtray Smell Remover Granules will truly cleanse the ashtray and air of offensive odors, complement existing ventilation systems and result in a fresh smelling environment. This will help create a healthy, chemical free atmosphere that will certainly be appreciated by all. Smelleze® Ashtray Odor Removal Granules are non-flammable, has the ability to reduce the explosive nature of any gas it absorbs, can act as a fire retardant and is totally safe to use. For a breathe of fresh air, simply place the attractive Smelleze® Ashtray Smell Control Granules in any commercial or consumer sized ashtray and smell the difference. 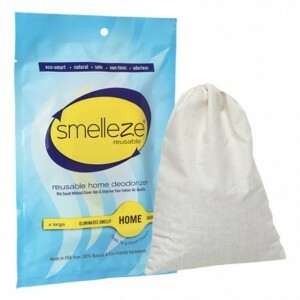 Replace Smelleze® Deodorizer Granules when you detect an increase in odor or if looks unattractive. This product may also be placed in open top containers in smoking areas to eliminate smoke odors. Smelleze® Ashtray Odor Remover Granules are non-toxic, safe, recyclable, natural, odorless, non-flammable and non-caustic. 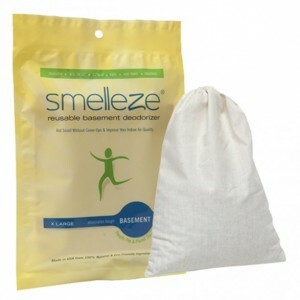 Smelleze® Odor Control Granules is an ideal environmentally friendly solution for eliminating unpleasant smoke odors without adding pollutants to the air you breathe. It does not contain VOCs, harmful or ozone depleting chemicals and is especially beneficial for those suffering from allergies and chemical sensitivity. No fossil fuels are used in the production of Smelleze® odor eliminator deodorizer media.